These webpages feature copies of my independent music business advice column called "So You Want to Be in a Rock & Roll Band? ", published in every issue of Loud Fast Rules magazine (from the publishers of AMP - American Music Press magazine, which publishes my other column, "Ranting, Raving, and Rocking", a political commentary and also a musical review column. This column will be all about the ins and outs of the music business based on my experiences from playing music since 1975. I'm going to be real and no holds barred about every facet of the music business from the top to the bottom. It's pretty much advice and discussion, what stinks and what is great. I'm going to tell you what other people won't. Feel free to contact me and let me know what worked for you, if you have some good advice for people. You can click on each link on the right that goes to each column that has been published so far. Also, there are other links for related websites, such as music business consultants, and other companies and people that can help bands survive and even thrive in the music business. There are many aspects of the music world, and every one of them has things that happen in them that can either totally mess you up or can be great if things work out right for you. the people in the bands themselves; the booking agents; the promoters of the shows; the clubs, halls, etc. ; the lawyers; the recording studios; the record producers; the A&R people; the radio stations and the DJs; the internet and music websites; the music shops that carry supplies and instruments; the record labels; the distributors; the record stores; the merchandise manufacturers; the music press and the fanzines and newstand magazines; and the audience. So, in each column I am going to talk about one or more of these aspects and it ain't going to be pretty! For over 30 years, I have been playing music in Rock & Roll bands. Over the course of the years I have learned from my own and other people's mistakes and successes in the music business, allowing one to survice and do very well on one's own terms as an independent act. Also, I have met many people from all facets of the music business that have consulted me and others about new strategies, ideas, education about what really works. Presented on these pages are words of advice that I have experienced over these many years. Click on the links given on the right side of this page to enter the pages for each column I have written on the topic, as published by Loud Fast Rules magazine. Each page is set up as a Phase of time, with various steps to be followed, strategy, direction, advice, and so on. This advice is for all kinds of Rock bands, such as Punk, Garage, Hard Rock, Heavy Metal, and so on. Bands have written me from all over the world thanking me for revealing these steps. Whereas before they were languishing from public indifference, after changing things for the better by following the steps laid out in each Phase, these bands are now enjoying far greater success in a short amount of time than all the years they had spent previously going nowhere. Well, from the publishers of your favorite AMP Magazine comes Loud Fast Rules! (LFR! 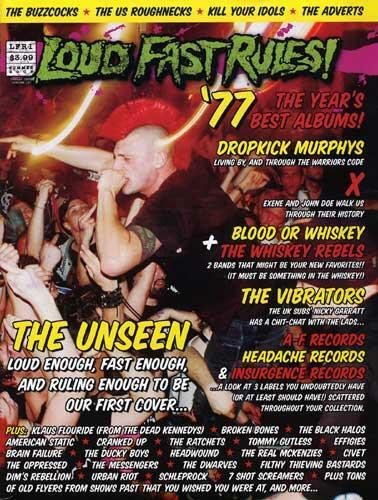 ), a magazine dedicated more to people that run in circle pits than that kung-fu dance at shows. This is more in the line of AMP’s previous publication, HIT LIST. Punk rock, street punk, Oi!, power pop, garage rock, glam, etc… LFR! is also blessed to have some of our good friends and drinking companions writing for us, such as Lars Fredericksen of Rancid, Tripp from the Unseen, Blag from The Dwarves, Jake from The Casualties, Duane Peters from, well… like 10 different bands (but they all rule! ), Sal from Electric Frankenstein, Al Quint from Suburban Voice, and many more. LFR! will only be published 3 times a year, and is available from places such as Tower Records, Interpunk, Borders, Hot Topic, FYE’s, and the coolest of the cool mom and pop stores around the country. Every issue is shrink wrapped, and comes with at least one free CD. All of our back issues (except Issue 2 - that one is all SOLD OUT!) are available at Interpunk, as well as Angry, Young & Poor so if you're just finding out about us now - get yourself over there and see what you've been missing! !